St. Patrick’s Day was [on Sunday]. Traditionally known as the biggest drinking holiday, I wondered whether the stock market often suffered a hangover the next day. The study below looks at performance for SPX on the day after St. Patrick’s Day from 1978 – 2018. The numbers appear impressively bullish. Below is a look at the profit curve. 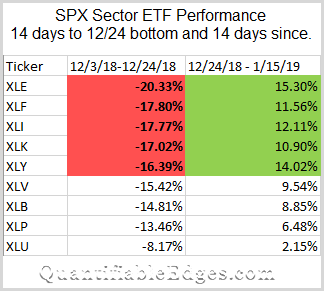 Continue reading Is the $SPX Prone to a St. Patrick’s Day Hangover? 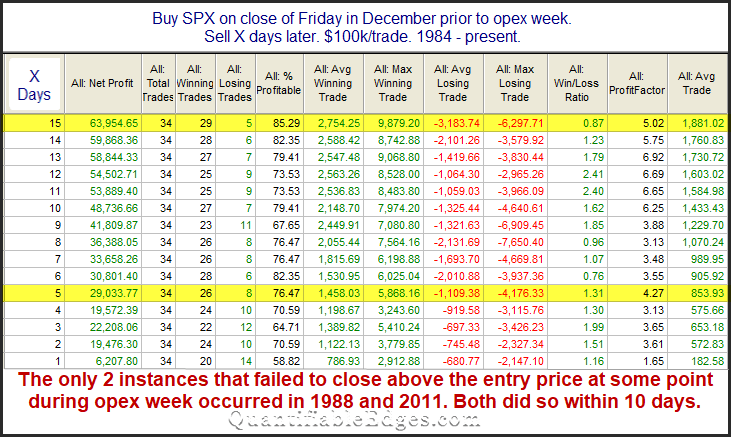 The decline in SPX meant it was the 3rd day in a row in which it closed lower. 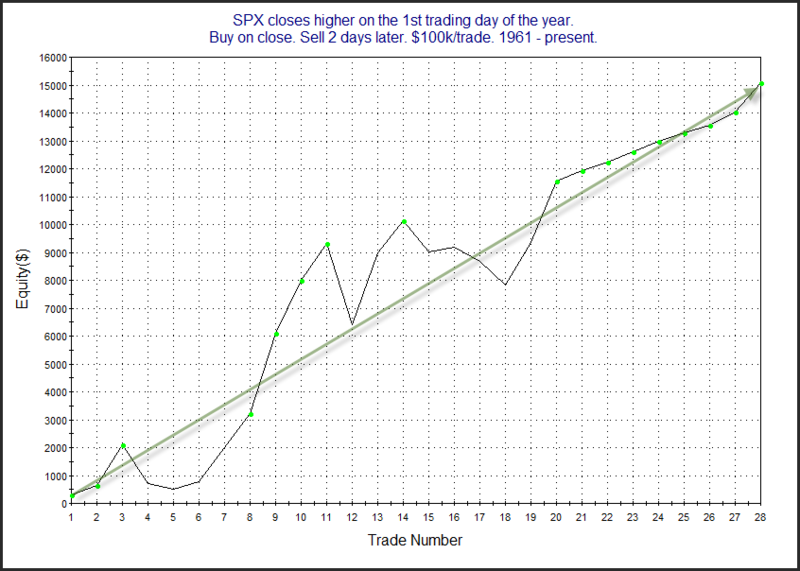 3-day pullbacks will often suggest an upside edge. 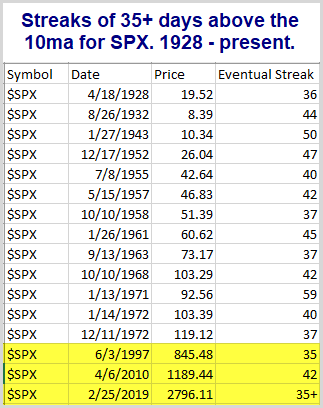 I also found it notable that 1) the pullback originated from a 50-day high, and 2) it left SPX at a 10-day low. So I examined other times we saw such drops, and found some interesting results. Historically we see that 3-day drops from 50-day highs to 10-day lows have often by followed by a bounce in the next few days. Traders may want to keep this in mind as they determine their trading bias. How Low Could the S&P 500 Go? I’ve been meaning to ask (and possibly) know the answer, 2100-2200 for H1 2019 is your ultimate bear market target or opening act? Opening act. It could be the ultimate target because there is a lot of support at that area and a good solid bear phase could put the Fed on ice and impose some changes to Donald Trump’s bull in a China shop policy style. So for now I see no reason to make dire proclamations beyond that key support level, as so much will depend on incoming information in 2019. At this point, even 2100-2200 is not technically in the bag because the US stock market clung to last ditch daily chart support, as per the marginally favored short-term NFTRH view. So all of we bear callers need to remember that as ugly as the charts are, support is not broken until it is… broken. I was going to cover this in NFTRH 530‘s Opening Notes segment, but why not make it a public post and save NFTRH’s virtual ink for more immediate issues going on with the markets? Before we dial out to a couple of simple SPX charts showing the prospective downside targets, lets review the situation with a less than simple chart. Continue reading How Low Could the S&P 500 Go? I decided a couple weeks ago add a regular segment where I just talk about some things I think I know about a given market or situation based on the previous week’s activity. This is before I get myself educated on the latest market data and information. I need the weekly work I do in NFTRH as much as anyone. Without it, I can be rudderless and prone to my own biases. This is just one small, less mission-critical aspect of NFTRH (representing 2 of 52 on-point pages across the markets) and the funny thing is, I think it stands up to much of the premium stuff out there in its entirety for any given week. But then, I am biased and as such I think NFTRH is better than any other market report or newsletter that I know of out there.